Steam systems at oil refineries and other large industrial complexes such as pulp and paper mills or large chemical plants are very large energy users that have many degrees of freedom. Manipulating these degrees of freedom with a cost based optimization program usually can result in significant savings in operating costs for a small investment. This is particularly important with electrical deregulation in the United States. Since the electrical system is the main economic trade-off with a steam system, electrical deregulation provides many new challenges to operating the combined systems at minimum cost. High incremental electric prices found during electric shortages have resulted in economics to shut down some plant production (of product) and replace that production at some other site (with lower incremental electric prices). This results in extreme savings in electric purchases or increases in electric sales. Low incremental electric prices can result in economics that suggest shutting down gas turbine cogeneration trains, especially at night. In the this paper, Visual MESA will be described and then the meat of the paper will focus on the key optimization variables and constraints in steam system optimization and how they should be handled. This paper will not try to describe all the features of Visual MESA or fully explain on-line optimization technology. Visual MESA helps manage your steam system by monitoring all variables and providing alerts on important changes. It tracks key operating parameters including economics. It helps in emergencies with directed load shed advice. Visual MESA find show to run the steam system at minimum operating cost using SQP optimization. The optimization is customized to your facility so no infeasible or unsafe moves are recommended. VISUAL MESA for "What If?" Use Visual MESA to predict how your steam system will respond to a proposed change such as a new plant, a plant change, a shutdown or whatever YOUR facility needs to understand. Using Visual MESA's data validation techniques, you can accurately account for steam use and track down waste and inefficiencies wherever they exist. In the rest of this paper we will now focus on the optimization features within Visual MESA. Visual MESA is built on the steam system modeling program MESA (Modular Energy System Analyzer) from the MESA companyi. The SQP (Successive Quadratic Programming) optimizer from L. Lasdonii at the University of Texas at Austin is used for all optimization although it has been significantly tuned and customized for steam system optimization where there are many mixed integer problems. Continuous variables such as steam production from a fired boiler or steam flow through a steam driven turbogenerator. It is also important to determine if the unit should be shutdown recognizing the minimum operating limit of the unit. Discrete variables where the optimizer has to basically decide if a particular piece of equipment will operate or not. The most common occurrence of this kind of optimization in refinery steam system is spared pump optimization where you have to choose which of two pumps to operate, one of which is driven by a steam turbine and one by an electrical motor. Direct Equipment Constraints. An example of a direct equipment constraint is turbogenerator power output. In a turbogenerator you may optimize the steam flows through the generator within specified flow limits but there will also be a maximum power production limit. Abstract Constraints. An abstract constraint is one where the variable is not directly measured in the system or a constraint that is not a function of a single piece of equipment. An example of this type of constraint is steam cushion (or excess steam production capacity). Steam cushion is a measure of the excess capacity in the system. If this kind of constraint were not utilized then an optimizer would usually recommend that the absolute minimum number of steam producers be operated. This is unsafe because the failure of one of the units could shut down the entire facility. This section will describe and discuss several of the important optimizations found in refinery steam systems. Single and dual fuel boilers are optimized in similar ways. Here we will show an example of a dual fuel boiler. predicted and measured steam flows match. The efficiency of B3-OIL is controlled to be a fixed percent of the efficiency of B3-GAS. The two optimizers manipulate the heat duty of the respective fuel burners. The limits should represent the firing limits of the respective burners. The constraint on the meter limits the flow of the boiler within its normal operating range. An on-line method of measuring efficiency. These factors are important to capture because dual fuel optimizations are not just controlled by the relative boiler efficiencies but also the costs of the fuels. They are limited by real constraints in the refinery, which specify that so much of a particular fuel must be burned in the refinery because there it is produced as a byproduct in the refinery and can not be sold. It must be burned. In the US refineries this is typically a fuel gas constraint. There may also be a total limit on a cheap internal fuel source as well. The intersection of all these variable provides a very complex optimization that can have very profound economics. When a boiler optimization allows boilers to shut down you must deal with a constraint on the steam production spare capacity (sometimes known as steam cushion). If you don't deal with this constraint Visual MESA will tend to aggressively shutdown boilers until you will have very little spare capacity. This may be the minimum operating cost method to operate the steam system but it is not operationally robust. Without some spare capacity built into the system, a small steam failure could cascade into an entire facility shutdown. Here is how to deal with the steam production cushion constraint. In most Visual MESA models, schematics are created that represent the real physical steam system. We can also use the MESA blocks to do logical and arithmetic calculations for other uses. 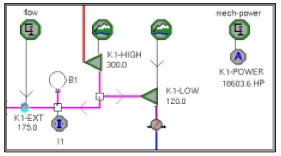 The drawing below is a logic drawing that determines the total and spare steam production capacity for a steam system with three fired boilers. In the upper left is a collector (or tank) component that adds up the total flow of all the boilers. In its specification is the name of each boiler. This table is utilized to provide the SQP optimizer derivative (slope) information. If we don't have a continuously increasing values the derivative would be zero and the optimizer would not have any directional information on how to satisfy the constraint. The total available capacity is then added up. A meter block is used to subtract the current generation from the current capacity. The result is the Total Spare Capacity. A constraint is used to insist that the spare capacity be above some minimum value. Usually the constraint should allow the bounds to expand so the optimizer is not penalized for current operation outside the limit and also to prevent infeasible solutions when it is impossible to satisfy the minimum limit. A single condensing extraction turbine models as two separate turbines. One from throttle pressure to the extraction pressure and one from the extraction to vacuum pressure. The accumulator component on the far right calculates the total power from the drive turbine. The constraint above it is an equality constraint on mechanical power. This insures that the mechanical power of the unit remains constant at all times during optimization. The correct mechanical power is determined from the simulation results. In many turbine optimization like this there are two degrees of freedom to optimize but we know all three flows. Selecting which flows to optimize is usually not important for the optimization. In this case we selected the optimization of the high- pressure turbine throttle flow and the low-pressure turbine exhaust flow. The extraction steam is determined by difference and is limited with in its operating limits with the constraint block. It is very important on condensing turbines like this to know the surface condenser pressure accurately. The amount of power produced in the low-pressure section of the turbine is extremely sensitive to this number. Good efficiency curves are also important to have especially if there are multiple, parallel drives turbines in the system. Here is an example of a set of cooling tower pump drives there are four 500 HP pumps. One is driven by a high pressure to medium pressure back pressure turbine, one by a high pressure to condensing turbine and two by motors. Currently, three of the pumps are running (the two turbines and one motor). The optimizer can manipulate the pumps but must maintain three in operation. The constraint hooked to the CT-1-GROUP is either an equality or a minimum constraint on the total mechanical power of all operating pumps. In other words, it requires the optimizer to maintain at least as much total mechanical power from all pumps at the end of the optimization as current operation requires. 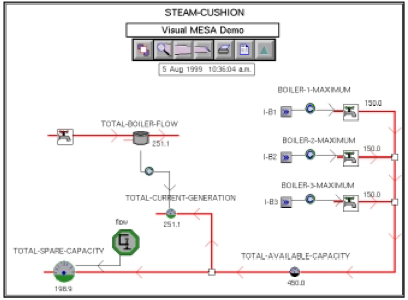 In this paper Visual MESA, an on-line steam management program was described. 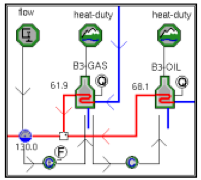 We also discussed several of the key optimization problems found in a typical oil refinery steam system such as boiler optimization, extraction-condensing turbine optimization and spared pump optimization and described how those problems are handled in Visual MESA. ii Y.Fan, S. Sarkar, and L. Lasdon, "Experiments with Successive Quadratic Programming Algorithms," Journal of Optimization Theory and Applications, Vol. 56, No. 3, March 1998.